MY: The UN Committee on Human Rights has recently criticised the UK’s human rights record, specifically highlighting the libel laws, the Terrorism Act 2006, and the treatment of the Chagos Islands. There’s a widespread perception that the war on terror has weakened human rights provisions. Would you agree with that? GGG: Oh, certainly. I think Blair’s dictum that the ‘rules of the game have changed’ was a signal to those undemocratic elements – the anti-human rights elements – in the bureaucracy in this country to do what they were very keen to do anyway, which was to enhance measures of control over citizens and non-citizens alike. And I think that has led to the tragedy of indefinite detention, which is still being worked out in the context of control orders. But that rush to exercise control has done serious damage, in this country and elsewhere, to human rights and fundamental freedoms. At the same time, I think we can see a swing back in the pendulum. In many respects, the courts in the UK, while respecting the sovereignty of Parliament, have been very keen to remind the executive that they are not Parliament, that they may only exercise such powers as have been legally entrusted to them, and that those powers have to be exercised according to the rule of law. And they have reminded the executive that a ‘war on terror’ does not give them carte blanche to detain anyone indefinitely. Likewise with the allegations of torture and ill-treatment. The courts in this country have been good to the extent that they have refused to accept at face value what executives like to claim everywhere, which is: ‘if we say it’s so, then you can’t inquire into it.’ In that respect, our record is much stronger than that of courts in the United States, which have been too ready to adopt the government’s claim of state secrecy, as the reason for barring litigation on issues which should certainly see the light of day in court. MY: The European Court of Human Rights has recently found against the UK in a number of cases, specifically on control orders, after which the court was criticised by Lord Carlile. We’ve recently seen the right-wing think tank Policy Exchange calling for the complete withdrawal of the UK from the ECHR jurisdiction. Is that kind of backlash likely in the UK? GGG: I’m not so sure that it will actually have the effect that the extremists want. The idea of withdrawing from the jurisdiction of the ECHR appeals to the petty-minded nationalist, I suppose, but it does not reflect any deep understanding or knowledge of the background of the European Convention, or any deep understanding or knowledge of the judgements of the country. That’s not to say there aren’t issues – there always will be issues – but the fact is the UK played a major role in drafting the European Convention on Human Rights. The reason it was slow to allow the right of individual petition reflected a rather arrogant understanding (although I can understand how they got to it) that all was well in the UK, and that UK law made adequate provision for the protection of those human rights now set out in a formal international instrument. But at the same time, the UK was very keen to export the European Convention model, which was often used as a basis for Bills of Rights tacked onto independence constitutions of countries of the Commonwealth which had achieved their autonomy. It was sometimes thereafter rejected by those countries – but the UK’s view, based on its experience and legal traditions, was that this was a very good instrument on which to base human rights protection. But as I said, there are issues. I was personally very surprised when the decision of the European Court of Human Rights on voting by prisoners attracted the ire of the tabloids to the extent that it did. I’ve worked on elections in the past, and I thought this was really a non-issue – one might have different views on it, but I was surprised by the vitriolic response among some quarters. I didn’t think, and I’m not entirely convinced, that this is a matter that the public is really concerned about one way or the other. It’s a matter which the government of the day, and their tabloid supporters, could use to generate anti-human rights sentiment, but I’m not sure that it’s the serious issue it’s made out to be. Also, many of the Court’s judgments in a migration context have attracted controversy, even if, on the facts, they were rather unexceptional. We hear our Secretary of State for Justice claiming that the court should not see itself as a court of appeal in asylum and immigration cases: again, if we look actually at the decisions themselves, we will see judgments that people might differ on, but which involve issues which are always going to have to be decided one way or the other. If we were to withdraw from the European Convention – a ridiculous notion – our decision makers, the Home Office, would still have to make these assessments, would have to ask itself whether in the case of someone who had been convicted of a criminal offence, they now should be deported. They would have to take into account, because families and MPs would demand it, the question of private life, best interests of the child, and the like. These decisions aren’t simply going to vanish simply because you step out of the European Convention. The advantage of the Convention for ministers and policy-makers, if they would only get their heads out of the sand, is that it does actually provide a structured approach to appreciating the human rights dimension of a number of different types of governmental decisions. It’s an approach which is by no means alien to the UK at all – it’s something which we have been doing for years. 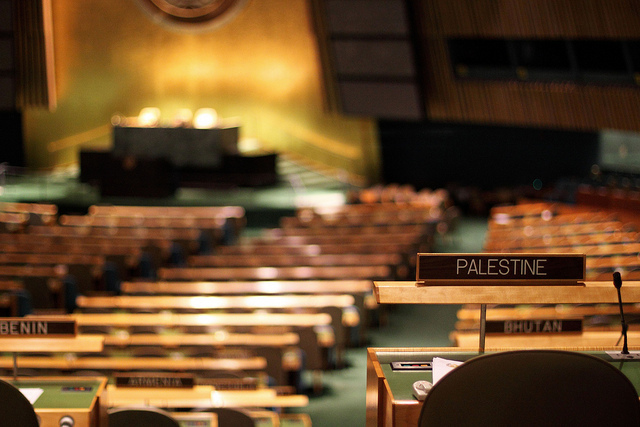 MY: In your legal opinion on the recent Palestinian statehood bid at the UN, you wrote that ‘the interests of the Palestinian people are at risk of prejudice and fragmentation.’ Could you explain your reasoning? GGG: This is one of those issues that has bothered international lawyers for some time: the question of who represents the state. Traditionally, international law has not been concerned with what happens, as it were, behind the veil of statehood. Basically, if you had power, no matter how you exercised it – tyrannically or democratically – and were in control of a piece of territory, you could present yourself as the representative of a state. Of course, with the principle of self-determination in the picture, with the recognition in the Universal Declaration of Human Rights that the authority of government derives from the will of the people, other elements are beginning to creep in. And I think we are rightly beginning to ask, not just in the Palestinian case but generally also, who is it who actually represents the state? Do they have behind them an exercise of the will of the people? And in the case of Palestine, it is the people who have long been recognised as the principal actor in the process of finding a solution. Up to now, the PLO that has been accepted by the UN and the international community as the sole legitimate representative of the Palestinian people. Now we see, incidental to the separate issue of the move to statehood,something else entering the picture, another entity that claims, or seems at times to be claiming, to take the place of the PLO as the legitimate representative of the people of Palestine. And that’s what worries me: there is suddenly a gap between the PLO – for all its representational deficiencies – and the putative ‘state’, which in large measure has little or no representational legitimacy whatsoever. For now the only general elections that have been held in Palestine in recent years are those that saw Hamas elected in Gaza – free and fair elections, certified internationally – with a substantial majority accruing to Hamas, which Tony Blair would surely have envied. In the case of the Palestinian Authority, among others, there’s an electoral gap there which needs to be filled. And I think that this is one of the challenges for Palestine, to allow the voice of the Palestinian people to be expressed, and I don’t just mean those in the OPT, but also those in the diaspora — the nine or ten million Palestinians in all, many of whom are very anxious to vote, as they should be. After all, it is their right of self-determination, right of return, right of compensation, which is likely to be at issue in the final move towards statehood. So my concern was with the issue of representation, not the bid for statehood, which itself reflects frustration on the part both of Palestinians and the majority of UN member states, at the intransigence of an Israeli government which pushes ahead with its desire to take under its control of more and more of the land that belongs to the people of Palestine. MY: The Palestinian issue is famous for the mass of legal rulings on the one hand, and power politics on the other. There is a growing movement amongst Palestinians to disregard the 1967 borders and begin a civil rights campaign within the entire region for a unitary, democratic state. With that in mind, what do you think are the obstacles to the implementation of UN resolutions on the conflict, and do you think international law can have an effect even when it is being obstructed by very powerful states? Or do you think it makes sense, in such situations, to domesticise the conflict, as it were? GGG: On the international law side, I would like to be optimistic. I’d like to say, look at the advisory opinion on Namibia, which I think was a seminal moment in the jurisprudence of the International Court of Justice, because it did actually contribute to changes in the positions of various states on the issue of South Africa’s control over South-West Africa. It contributed to the sanctions regime, and to the isolation of South Africa, and against the power politics of the day – British governments were very hostile to this idea, but they came round. One would like to think the same could happen with respect to the advisory opinion of the ICJ on the Wall, but so far it hasn’t. Is it too soon? I would have expected and hoped to have seen some progress amongst states to ensure that their policies towards Israel were in line with that judgement, and I don’t see that. And that is unfortunate. As an optimistic international lawyer, I would like to think that there is still time for change, but I can understand that people at the grassroots, on the ground, do not see that happening, but wonder yet again what’s going on and whether their tactics at the international level do not need to change. I would have sympathy for that approach, for the expected impact of the ICJ advisory opinion has not been realised. Perhaps we should have another ICJ opinion? One could ask the Court specifically, as was done in the Namibia case, about the legal consequences of that ruling for states in their relations with Israel, the occupying power. MY: What do you think is the likelihood of going back to the ICJ? GGG: It’s always an option – I don’t think there’d be difficulty in getting a request from the General Assembly. The majority is there, and those in opposition to it are relatively few in number. The art is in the framing of the question, of course, but one could certainly put it in such a way as to appeal to a very large number of states as a practical and useful way of pushing the move for Palestinian statehood ahead. Could you comment on the recent UNESCO bid, and the subsequent US withdrawal of funding of funding from UNESCO? GGG: One does despair of the US, at times. They have such a funny approach to these issues. To withdraw funding from an organisation because of what, from one perspective, was a relatively innocuous bid on the part of a people whose claim to international representation had long been accepted by the UN and the international community, to sanction a whole organisation because of that, is rather pathetic. We understand that it’s a consequence of US law, rather than anything else, so it may be impossible for the executive to do anything but follow through and withdraw its support. What can one do in a situation like that? I think we regret that it’s the American style, the big stick approach. We know, from experience and from the outside, that this tends not to work or to achieve much, but we’re going to have to learn to live with it for the time being. MY: Could we talk about the targeted killings approach of the US in recent years, particularly drone targeted killings happening in Afghanistan/Pakistan region, but also in places like Yemen? From a grassroots perspective, there has been lots of concern about this from human rights organisations. What kinds of options do you think are open to them in terms of international law? GGG: There’s a formal answer, which is less than satisfying, and then there are the difficult questions. Unmanned drones are a weapons system which is certainly not forbidden by international law. To some extent, they’ve been used in crude form for decades, and in a situation of conflict, one can well imagine drones flying back and forth, doing exactly the sort of things that manned aircraft would do in any such situation. But that, of course, is not the problem. We’re concerned with drones being used as weapons systems on the periphery of recognised armed conflicts – for example, the case of the drone that recently came down in Iran. Was that being used for spying, for targeting purposes in relation to those who might be ferrying arms from Iran into Afghanistan? We don’t know, and that’s where it all gets rather worrying. We are not sure exactly of the contexts in which they’re being used. We do know that they’re also being used as killing machines in relation to those suspected of being involved in al-Qaida and other subversive organisations. If that were done in the context of an international armed conflict, one could hardly take exception to it, at least if the normal rules governing the conduct of hostilities were followed, so that military targets were identified and engaged, proportionality was involved, steps were taken to reduce the likelihood of civilian causalities, and so forth. If the target was clearly an enemy combatant, it would be difficult to criticise. But the so-called war on al-Qaida is not a war in the normal sense of the word; it’s not a war to which the rules of armed conflict apply, and there is reason for concern about the use being made of drones in countries such as Yemen. In so-called counter-terror operations, drones are often used as a substitute for criminal prosecution. There is considerable support for the view, and I would endorse this approach, that one of the best weapons in the fight against terrorism is international criminal law, rather than targeted killing or the use of armed force. Claiming the existence of an armed conflict or relying on the laws of war, by contrast, can give rise to innumerable problems. For example, who is piloting these drones – civilians, the CIA? Are they out of uniform, sitting in remote parts of the United States, flying drones via satellite over particular areas and using the weapons systems to knock off this or that person? That raises questions – let’s assume it’s the US doing it – that the US may not want to face up to, which is to accept that under the laws of war, those who fly from the apparent security of CIA headquarters become combatants, that is, legitimate targets; because they are no longer civilians, they themselves can be targeted in return. And this seems to me to be an open invitation, to those with whom you are in conflict, actually to come and engage with you on your own territory. There are issues here which haven’t been thoroughly thought through on the American side. Plus, of course, and this is currently a matter of some debate for President Obama, there is the question of killing Americans. Recently a couple of US citizens have been deliberately targeted and killed by US drones. You can be sure that one day soon the courts are going to have to wrestle with this, because the constitution does aim to protect US citizens, whatever their views and actions. It will be interesting to see whether the courts will be able effectively to defend the constitution. I’m not that optimistic, mind you, particularly given present and recent tendencies, but these are questions which will have their day in court. MY: Many thanks for speaking to Ceasefire.